Will Venters will focus on the strategic use of cloud computing, questioning whether our focus on private and public sets too great an emphasis on the organisational boundary. 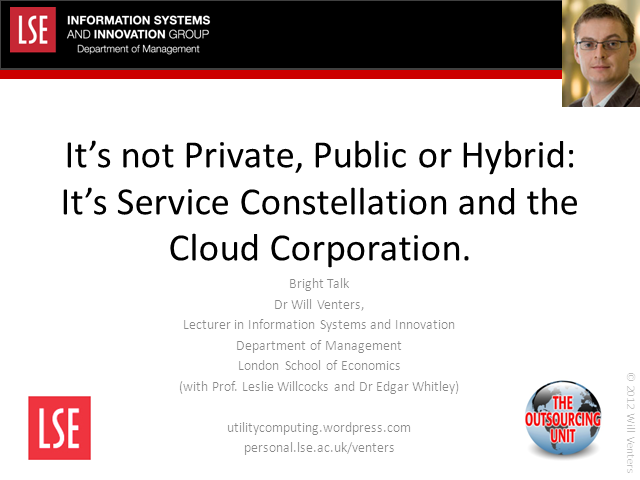 By adopting a view that we should instead look at firms as service-constellations and challenge this boundary, he will look at how future organisations may capitalise on a move to cloud. This is not however a utopian picture, with significant challenges and risks of such a move highlighted and explored. Dr Will Venters' research and teaching focuses on distributed systems development, cloud computing and knowledge management. He is a lecturer in information systems at the London School of Economics. He has researched and advised on the organization of distributed work and systems in various organizations including government-related organizations, the construction industry, financial services, health and research. He has undertaken consultancy for a range of companies, including recently producing (with two colleagues) a series of five reports on Cloud Computing for Accenture. He has published articles in journals such as the Journal of Management Studies, Information Systems Journal, Journal of Knowledge Management Research and Practice. He is an associate editor of the Journal Information Technology and People.